This article is about the municipality in Vest-Agder, Norway. For the town in Mandal municipality, see Mandal (town). Mandal (help·info) is a municipality in Vest-Agder county, Norway. It is located in the traditional district of Sørlandet. Mandal is the southernmost municipality in all of Norway, with the tiny skerry of Pysen being the southernmost point of land in Norway. The administrative centre of the municipality is the town of Mandal. The town of Mandal is the second largest town by population in Vest-Agder county after the nearby town of Kristiansand and it is also the fourth largest city in all of the Sørlandet/Agder region. Besides the town of Mandal, the municipality also includes the villages of Bykjernen, Skjebstad, Sånum-Lundevik, Skogsfjord-Hesland, Krossen, Harkmark, Skinsnes-Ime, and Tregde-Skjernøy. The 223-square-kilometre (86 sq mi) municipality is the 321st largest by area out of the 422 municipalities in Norway. Mandal is the 77th most populous municipality in Norway with a population of 15,600. The municipality's population density is 74.1 inhabitants per square kilometre (192/sq mi) and its population has increased by 9.9% over the last decade. The river Mandalselva is a salmon river that flows through the municipality with its river mouth just outside the town. Mandal has many small, white-painted wooden houses, which is typical of towns at the South Coast of Norway (Sørlandet). The European route E39 highway connecting Kristiansand and Stavanger is the main road through Mandal. There are connecting airplane flights and ferries to Europe from Kristiansand. The town of Mandal was established as a ladested municipality on 1 January 1838 (see formannskapsdistrikt). On 1 July 1921, a part of the neighboring municipality of Halse og Harkmark (population: 221) that was next to the town of Mandal was merged with the town. During the 1960s, there were many municipal mergers across Norway due to the work of the Schei Committee. On 1 January 1964, the town of Mandal (population: 5,446) was merged with the rural municipalities of Halse og Harkmark (population: 3,676) and Holum (population: 1,127) to form a new, large municipality of Mandal. On 1 January 1965, an unpopulated area of Mandal called Svalemyren was transferred to the neighboring municipality of Søgne. On 1 January 2020, the three neighboring municipalities of Mandal, Marnardal, and Lindesnes will be merged into one large municipality called Lindesnes with its administrative centre being the town of Mandal. The municipality is named after the town of Mandal, which in turn is named after the Mandalen river valley in which it is located. The name Mandal which comes from the Old Norse name Marnardalr. The first element is the genitive case of the river name Mǫrn (now Mandalselva) and the last element is dalr which means "valley" or "dale". Prior to 1653, the town was named Vesterrisør (meaning "western Risør"). The name was originally referring to the island Risøya outside the town, and the first element was added in the 16th century to distinguish it from the town of Østerrisør (meaning "eastern Risør"), which is now simply called Risør. The coat-of-arms is from modern times; they were granted on 2 July 1921, just after Mandal became a town. The arms show three white/silver salmon on a blue background. They fish symbolize the importance of salmon fishing on the river Mandalselva. Mandal is the southernmost municipality in Norway that has a large salmon population, so therefore, salmon fishing also played a major role in the economic development of the village and its trade with the rest of southern Norway. The Church of Norway has two parishes (sokn) within the municipality of Mandal. It is part of the Mandal prosti (deanery) in the Diocese of Agder og Telemark. All municipalities in Norway, including Mandal, are responsible for primary education (through 10th grade), outpatient health services, senior citizen services, unemployment and other social services, zoning, economic development, and municipal roads. The municipality is governed by a municipal council of elected representatives, which in turn elect a mayor. Mandal borders the North Sea to the south, the municipality of Lindesnes to the west and northwest, the municipality of Marnardal to the north, and the municipality of Søgne to the east. The municipality includes many islands and skerries along the coast including Hille, Pysen, Skjernøy, and Skogsøy. The Hatholmen Lighthouse and Ryvingen Lighthouse mark the sides of the Mannefjorden which leads north into the town of Mandal. The majority of the municipality is located in the southern Mandalen valley which follows the river Mandalselva. Sjøsanden a warm summer day. Mandal is a very popular holiday resort, with its mild and refreshing summer climate. It is famous for its long-stretching beaches surrounding the town. Sjøsanden (The Sea Sand) is the most famous beach, as it stretches for almost a kilometre just outside the town centre. It is frequently ranked as one of Norway's most popular beaches. The city center is known for its charming concentration of old, white, wooden houses and the Mandalselva river running through it. Another attraction is the city's church: Mandal Church. It is the largest wooden church in Norway, with 1,800 seats and a pulpit on the wall behind the altar. Also, the library, art gallery, cinema, concert hall, and theater is located in the Buen kulturhus (culture house) which was built in 2012. The artists Gustav Vigeland, Adolph Tidemand, Amaldus Nielsen, and Olaf Isaachsen are all from Mandal, so the town is sometimes called "The Little Town with the Great Artists". 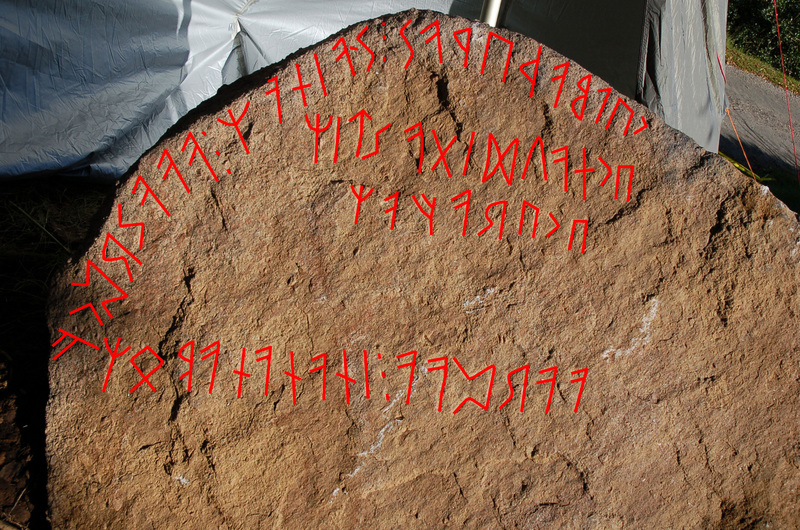 Hogganvik, in the Sånum-Lundevik area of Mandal, is the site of discovery of the Hogganvik runestone in 2009. Umoe Mandal is the municipality's new cornerstone, with the production of mostly military vessels, like these Skjold class patrol boats. Mandal is famous for its shipbuilding and engineering industries. There was much trade in sailing ships, where the natural harbor of Kleven at Gismerøya was used. Large yard providing ships and marine equipment in Norway and abroad are Westermoen Hydrofoil and Båtservice yard at Skogfjorden, the later Umoe Mandal. Moreover, the textile industry has been substantial, with several manufacturing companies that had at most 200-300 employees. Mandal is also famous for its annual Shellfish festival (Skalldyrfestivalen) the second weekend of August when many people gather in downtown to eat Norwegian seafood. The sculptor Gustav Vigeland (1869–1943) was born in Mandal, and has a museum dedicated to him here. Vigeland's main achievement is the Vigeland Sculpture Park (Vigelandsparken) in Oslo. The painter Adolph Tidemand (1814–1876) was also born in Mandal. His most famous painting is the national romantic image of a traditional wedding on the Hardangerfjorden, which he made together with Hans Gude. ^ Statistisk sentralbyrå (2017). "Table: 06913: Population 1 January and population changes during the calendar year (M)" (in Norwegian). Retrieved 2017-11-05. ^ "Nye Lindesnes" (in Norwegian). Lindesnes kommune. Retrieved 2017-11-05. ^ Store norske leksikon. "Mandal" (in Norwegian). Retrieved 2016-12-29. ^ "Civic heraldry of Norway - Norske Kommunevåpen". Heraldry of the World. Retrieved 2016-12-30. ^ "Buen kulturhus" (in Norwegian). Retrieved 2016-12-30. ^ Sellevold, Terje (2009-09-29). "Fant runestein i hagen". NRK (in Norwegian). Retrieved 2016-12-30. ^ Kippernes, Geir Arne (2009-09-28). "Kan ha funnet til nå ukjent runestein". Verdens Gang (in Norwegian). Retrieved 2016-12-30. ^ "Shellfishfestival in Mandal". VisitNorway.com. Retrieved 2016-12-30. ^ "Ystävyyskuntatoiminta" (in Finnish). Korsholm kommun. Retrieved 2016-12-30. ^ Runge, Benjamin. "Venskabsbyer" (in Danish). Middelfart kommune. Retrieved 2016-12-30. ^ Lindquist, Ted. "Internationella frågor och vänorter/partnerskap" (in Swedish). Oskarshamn Municipality. Retrieved 2013-07-25. This page was last edited on 6 January 2018, at 21:26 (UTC).